If you keep them in the middle you get more points! The Alaska Rifle Club is affiliated with the National Rifle Association of America and the Civilian Marksmanship Program. Membership is open to all without regard to age, race, color, creed, or religion. We are a shooters organization. We shoot many different types of rifle matches, so there’s a good change you can participate with equipment you already own. We even have rifles you can borrow to shoot a match! The club promotes organized competitive shooting and sponsors shooting activities such as High Power Rifle (F-Class, Mid-Range, Long-Range, Service Rifle, etc), Black Powder Target Rifle, Smallbore Rifle Silhouette, etc. We sponsor the NRA Regional High Power Rifle Match, NRA Regional Black Powder Target Rifle Match, and the Regional CMP Excellence In-Competition “Leg” Match, which leads to the Distinguished Rifleman/Marksman award. We promote civilian marksmanship and sponsor shooting clinics. 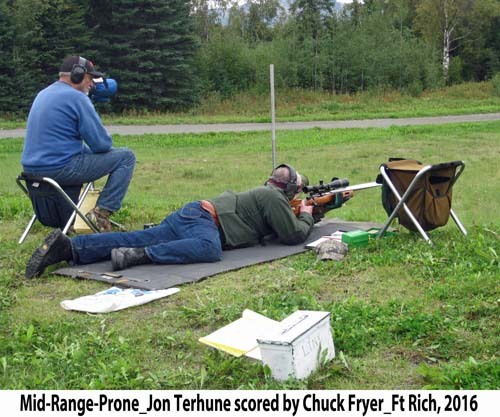 We hold regularly scheduled matches in Anchorage at JBER Pedneau KD Range (in Small Arms Complex east of Glenn Hwy) and Birchwood Recreation and Shooting Park in Chugiak.